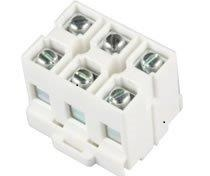 BlockMaster Electronics, Inc., a leading supplier of terminal blocks for electrical and electronic distribution, announces a new extension to its existing line of High Output Power modular feed-through terminal blocks, designed specifically for DIN Rail or panel mounting. The new 3-pole HP-RTG-C high power block is well suited for high power distribution in electrical panels. The new 3-pole high-power block is rated at 90 Amps and 600 Volts for electrical applications in power panel distribution. The new 3-pole HP-RTG-C high power block is well suited for high power distribution in electrical panels. This 90 Amp / 600 Volt High Power Block snaps onto a DIN rail or mounts onto a panel. Operating Temperature: -25° C to +150° C.
BlockMaster Electronics manufactures terminal blocks from 1 to 380 amps, including PCB styles up to 130 amps. The company offers over 9,500 P/Ns including PCB, Feed-through and Power Distribution types. BlockMaster’s Value-added Center can also provide quick turn around on prototypes.